Copyright 2009, Angel Heart Films, Inc.
"Caterina's dedication and passionate love of ballet makes her undertake challenges that most dancers do not dare to go!" -Maestro Stefan Wenta, Former Principal Dancer of the Paris Opera Ballet and Warsaws National Opera and Ballet, Artistic Director and Choreographer of Western Ballet of Los Angeles, Professor of European Dance Culture at UCLA, Artistic Director of Wenta Ballet of Los Angeles for over 40 years, Choreographer for REDS starring Warren Beatty. "I highly recommend this unique DVD to your aspiring little ballerinas. My five-year old daughter tells me that dancing along with Caterina is more fun than her ballet class. This DVD captures the beauty and magic of ballet. We never get tired of watching it!" "We had a hard time finding a high-quality educational ballet video. We were so excited to find this DVD at our local dance store. My daughter loved the idea of a cat being her ballet teacher. As a daddy, the DVD made it easy and fun for me to learn ballet along with my little daughter. I hope Caterina will do another DVD!" "Caterina gives clear, age appropriate instruction and delivers it in a highly engaging manner. Challenging skills are made easy and taught in a layered manner fit for all learning styles." "Our 2-year old daughter loves this DVD! Caterina is very engaging and a true ballerina. Our daughter has learn to say 'ballet", "plie", tendu" and even perform the steps and floor stretches! It is a great way to introduce your little ballerina to a beautiful dance form. We just purchased the DVD last month but we have already seen it 101 times. We have searched everywhere, there is not a better instructional ballet DVD on the market. I highly recommend this DVD for any parents who love the joy in seeing their children dancing and just having fun!" "Caterina Ballerina is such a wonderful, fun, easy-to-use and delightful DVD. I always hoped someone would produce a teaching DVD that combined the high standards of classical ballet with a child-friendly, entertaining and enjoyable method. All too often ballet teaching is dry and formal and humorless but this is the opposite: engaging, beautiful, imaginative, and motivating. I hope it inspires a new generation of children and teenagers to express themselves through ballet." "Caterina & Her Baby Ballerinas DVD is a wonderful idea to introduce children to classical ballet and what fun to see how imaginatively Caterina Ballerina has portrayed the steps and exercises. I have a 9 year old granddaughter and bought her the DVD immediately! Good luck to your venture, and here's to Caterina Ballerina 2."  "Caterina demonstrates ballet as a fun, beautiful endeavor that anyone can participate and strive to excel in. Great intro for someone new to ballet. The dancers are jewels & very talented!" "My 4 yr old daughter, Aoife loves the dvd! She watches and dances with it everyday. Caterina Ballerina dances so beautifully. I wish Caterina taught class in San Francisco so my daughter could take class with her. This website is very nice and I will spread the word about this dvd to all of my friends. My daughter is a big fan of Caterina Ballerina and wants to meet her one day. Keep up the great work and please keep us posted on any new developments!" "Caterina & Her Baby Ballerinas is a great video, my daughter Ailee LOVES it! She's played it almost every day since we received it in the mail. Thank you very much!"